A few days after Valentine's Day, or any other holiday involving flowers, you'll want to know what you can do with those lovely petals so you can enjoy them a little longer than the flowers will last. Here are some ideas for rose petal crafts you can make any time you have some extra flowers lying around. If you want to keep your roses whole, or would like to use the dried petals in a craft like potpourri, you'll need to dry your flowers. The easiest way to do this is to hang your flowers upside down in a cool, dark place. I like to use a closet to dry my flowers, and it has the extra advantage of scenting any clothes that might be in that closet. Tie a string around the stem of the flower, then tie the other end to a hanger or to the closet rod. Allow the flowers to dry for a couple of weeks before using. 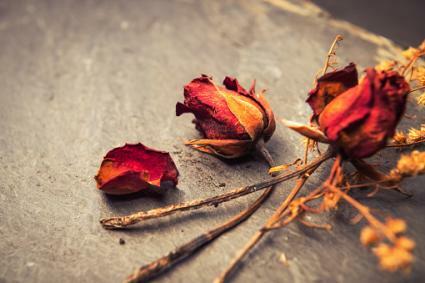 I have a few dried roses that have lasted very well for more than five years. Some flowers are not as pretty after drying, but dark colored roses almost always look nice (pink and white roses can turn brown, but they still smell nice). To use the petals, simple pull them off the stem. 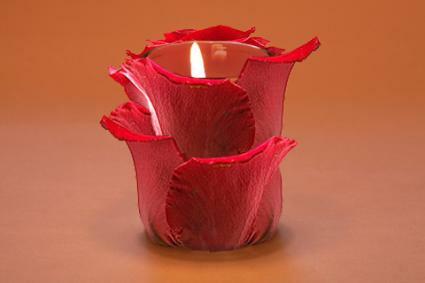 If your petals are still fresh, you can decorate votive candle holders with the petals. Choose a plain glass candle holder and a selection of about 20 pretty petals. Start at the top of the holder, making sure that the petals stick up over the top of the holder. Secure with a rubber band, then use a dot of hot glue to secure each petal. Once the glue has dried you can remove the rubber band. Make another layer of petals slightly below but overlapping the first layer, again holding them in place with a rubber band and securing with glue. The third layer should stick out over the bottom of the holder. Glue in place and trim the bottom of the petals so they are flush with the bottom of the holder. Add a pretty candle, and the rose scent will permeate as the candle burns. You could make a similar candle holder with dried rose petals, but it won't look as much like a rose when it's finished. It will still be pretty, though. One of the coolest things you can do with spent but not dried rose petals is make beads. The beads made from roses often turn out black, so it isn't critical that the rose petals be perfect. It is important, however, to use roses that haven't been sprayed with pesticides, because who would want to wear pesticides? Take your rose petals and grind them up in the food processor until they are about the consistency of couscous or rough sand. Simmer for one hour in just enough water to cover them. A cast iron pot or pan is great for this and helps turn the petals dark colors. After that hour of simmering, your house will smell great. Turn off the heat, allow to cool, and simmer for another hour. Continue to do this until the petals turn into a pulpy mess. Put the rose pulp in a sieve and squeeze out all the water that you can. If you're sure you used organic roses, you can save the rose water to be used in perfume, bath products or even as a flavoring for ice cream. Pinch off some of the pulp and make the bead into a ball. You can make these just about any size you want, and you can also make squares or other shapes if you like. Allow the pieces to dry for a day or two. Before they are completely dry, pierce them with a stiff wire so you will be able to thread them on beading wire later. 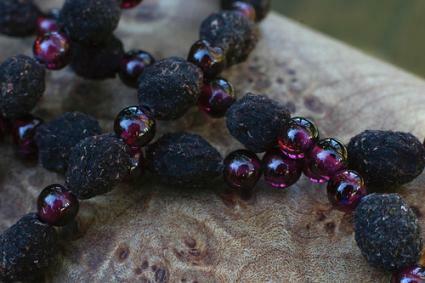 Once they have been dried you can use them as any other beads. These beads are somewhat fragile and shouldn't be worn in the shower or swimming pool. Beads can pick up odors, so you might want to store them in a sealed container away from smokers and other stinky things. 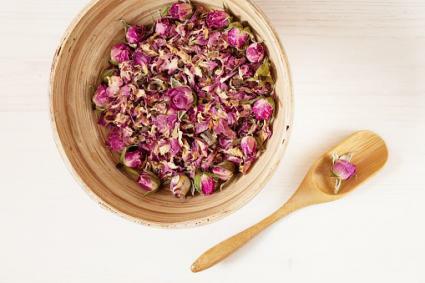 If you have already dried your roses, you can make a great potpourri quite simply by mixing a quart or rose petals with three tablespoons of orris root and a drop or two of rose essential oil. Allow the mix to sit for a couple of weeks, and add more oil if needed. More complicated potpourris can be made by mixing up whatever combination of dried flowers, herbs and oils that you like. Roses and lavender are particularly nice together. Mix equal parts of dried lavender and rose petals and add a few drops of rose and lavender essential oils. These potpourris make great gifts and hold their scent for about a year. The orris root helps the mixture hold its color.